Is there such a thing? Haha yes and no. It’s really just something we made up because S&R became one of our favorite go-to untracked/cheat meals during prep. Why? It’s relatively consistent, it’s cheap, and most importantly, it was a treat for us during an otherwise “strict” dieting phase. To prove that there is more than one way to lose fat/achieve body composition goals. That you can eat something that isn’t your typical “conventional” diet food and still make progress. We’re not saying you should go out and eat “junk” all day every single day, but there’s no reason for you not to enjoy foods like fried chicken, calzones, pizza or churros in moderation. Again, in moderation. As in, once a week (or twice, or everyday for all we care, make room in your daily caloric intake for pizza. No big deal. Make room for pizza, or ice cream, or whatever “junk” you want. It doesn’t have to be pizza, either. Heck it could be chocolate-covered almonds, banana chips, cheese, whatever. Your body, your rules. But can you eat pretty much any kind of food in the right portions and still see changes in body composition? Yes. When it comes down to it, ab definition is about developing your abdominal region and having low enough body fat to reveal the muscle underneath it. To burn fat, you need to be in a caloric deficit, or burn more calories or eat less than your body needs to maintain its weight. As long as you’re in a caloric deficit, you’ll be able to achieve your goal of having a six pack without having to give up your favorite foods. 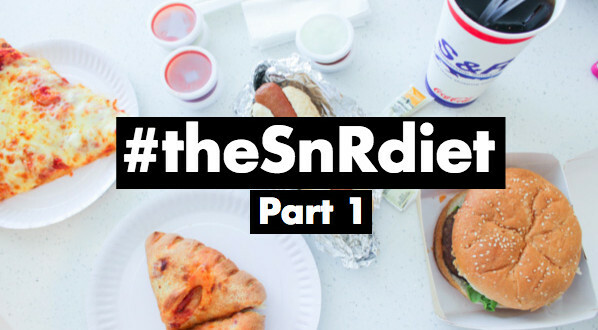 The S&R Diet is one example of how flexible dieting/IIFYM can be applied to suit your goals. In your case, you may not like S&R as much as we do so you can replace it with something else. However, the principle of it is this: you can eat whatever you want, in moderation, as long as you know how to manage your caloric intake. See, that’s the thing. People think that it has to be all or nothing, that it has to be all “healthy” food or all “junk” food, when really, the diet should be evaluated as a whole. If you have protein numbers to hit, you’re going to have to spend calories on things like beef, chicken, fish and eggs. If you have carb numbers to hit, you’re probably going to have fruit, bread, rice and vegetables. If you have fat numbers to hit, you’re probably going to have peanut butter, oils, butter and nuts. That doesn’t mean you can’t do substitutions once in a while if you want to. If you don’t like your diet, you won’t stick to your diet. If you’re constantly telling yourself to eat foods that you don’t like, how long will you last on such a restricted diet? Versus, say, a diet that gives you more freedom and doesn’t make you feel burned out. What can help you stay consistent in the long term? We’ve gone through each. and. every. single. food item. on the S&R menu. Why? So we could make some general recommendations on which items are more macro-friendly than others. Also, because it would be pointless to have something like The S&R Diet and have no material to show for it. See how we ranked the S&R menu items from most macro-friendly to least macro-friendly here. You might be surprised at the results! Part 3: S&R Pepperoni Pizza vs. Chicken Caesar Salad – Which is Better?